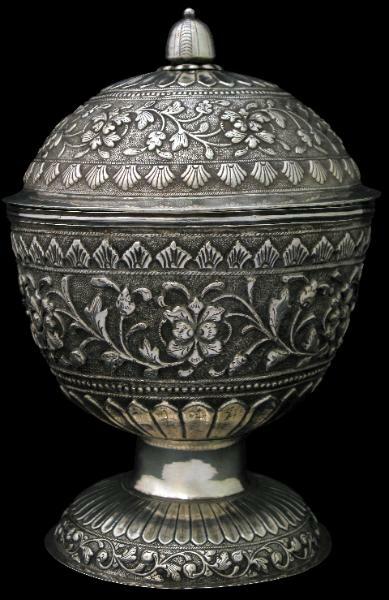 This unusual example of Malay silverware is in the form of an over-sized, lidded goblet, repoussed to the lid and body with a typically Malay scrolling orchid motif. The splayed food is decorated with an outer border of scrolling clove motifs. 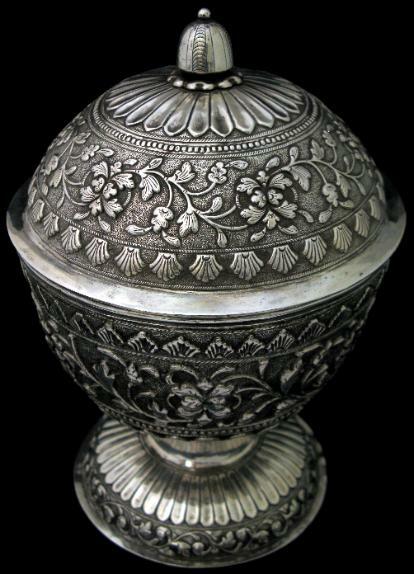 The top of the lid and foot are also beautifully decorated with fine radiating lotus petals. Traditionally, Malay men when asking for marriage would send a messenger to the prospective bride’s house with betel in a cup such as this. If the offer of marriage was accepted the parents or the girl would take the betel offered. If refused they would refuse the offered betel. Traditionally, Malays sat cross-legged on the floors of their houses. Floors in the better Malay houses were made from split bamboo or palm trunks, rendering the surface uneven, hence many Malay receptacles such as the cup here were made with wide feet. Also, the fact that such an item might be viewed from the top down might explain why the work on the top and the splayed foot which are visible from above is finer than the repousse work around the sides. 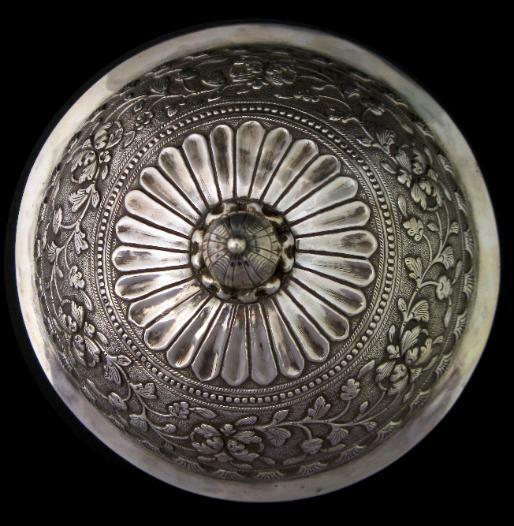 Ling Roth, H., Oriental Silverwork: Malay and Chinese, Oxford University Press, 1993.